My eyes are about eight inches from the edge of a rug with a colorful, Southwestern pattern. I’m specifically looking at six or eight tight rows of yarn, an indicator that it an excellent reproduction of a Navajo rug, but not truly Navajo. My tutorial is compliments of the owner of the Tin-Nee-Ann Trading Post in Santa Fe, New Mexico, who has exposed a one-inch section of the rug’s edge to illustrate the inauthenticity of the piece. 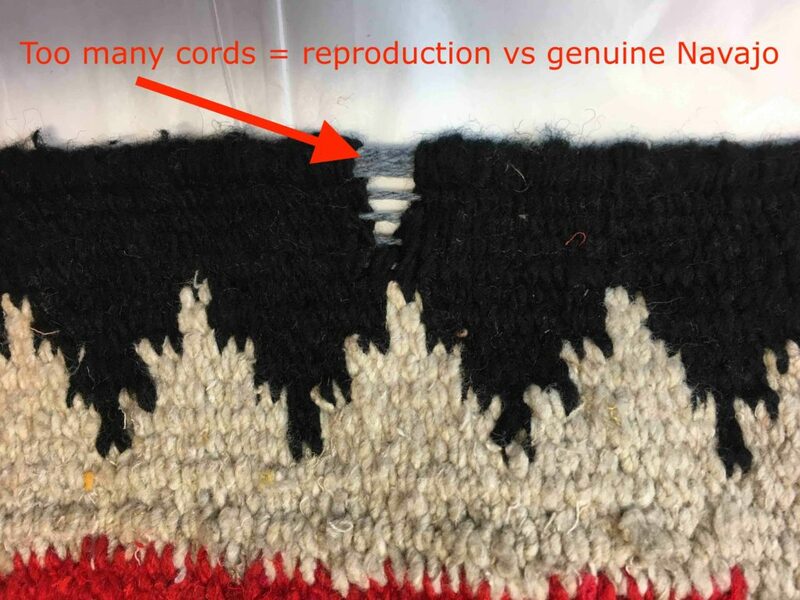 What else should buyers be looking for when verifying if the rug is authentic Navajo? The yarn making up the width is traditionally hand spun wool, though that has changed in recent decades given the tedium for hand spinning. Many of the rugs imported from Mexico, China and India are made using acrylic or other synthetic fibers, and you’ll see considerably more symmetry and precision in the designs because these rugs are machine made. 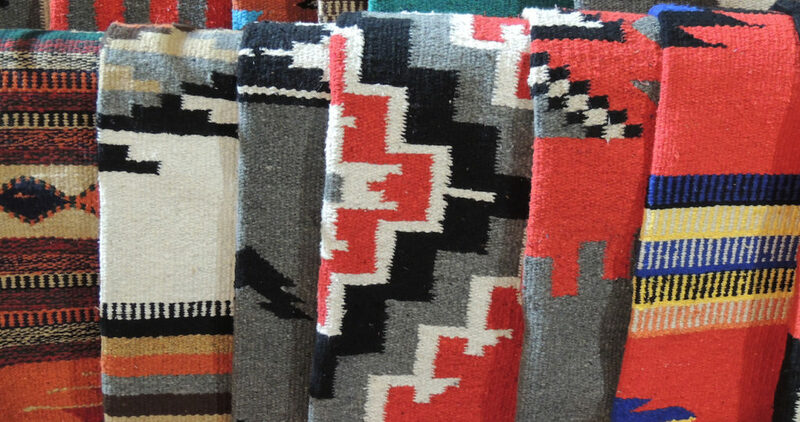 Since a genuine Navajo rug is hand-woven, the pattern is never uniform or exact. Extremely vivid colors are not typically used in Navajo weaves and, while simple corner fringes aren’t uncommon, you won’t see tassels on Navajo rugs. Don’t be fooled by authenticity tags affixed to the rugs either. 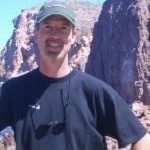 The lesson here is to buy from a reputable source, be it a long-standing trading post or art dealer, or if you know the Native American weaver personally. 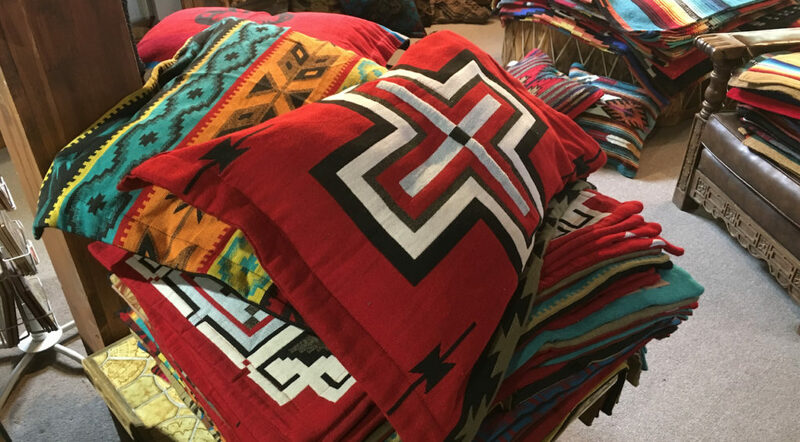 Though not quite like snowflakes, where no two are identical, each genuine, hand-woven Navajo rug is unique, which is why the authentic ones often command top dollar—with people paying hundreds and even thousands for them. Imported rugs should have a country of origin specified on them. Do your homework and you should be pleased with your purchasing decision. Following my primer on rugs, I follow Jo over to a display housing katsinas, figurines that represent spirits associated with Pueblo tribes of the Southwest. Katsinas have been used over the centuries in tribal ceremonies and as reminders for young tribal members as to the cultural significance of the spirit. 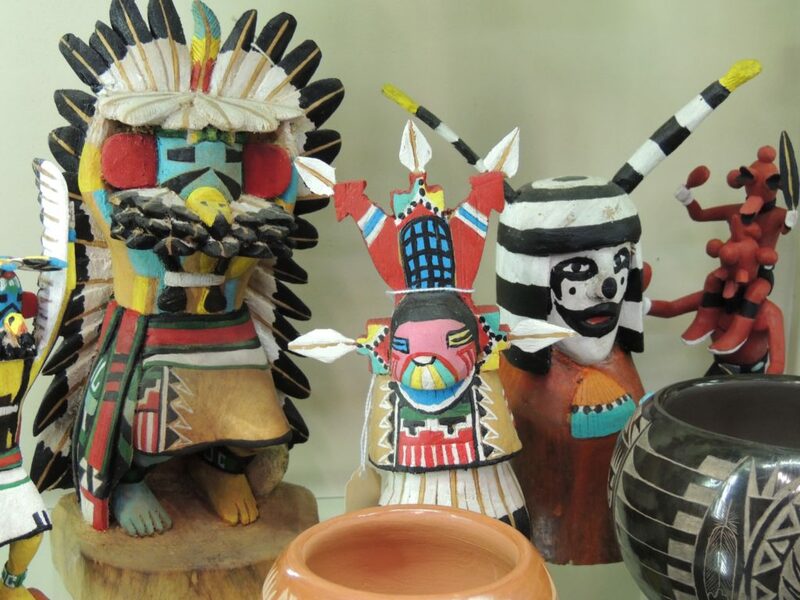 Depending on whom you ask, there are between 200 and 300 different kinds of katsinas with the bear, eagle, fox, clown, mudhead, Kokopelli and wolf among the most commercially popular. One thing to look for when shopping for authentic Hopi katsinas is that they are carved from a single piece of cottonwood. If the legs and arms are pegged and glued, chances are good it isn’t a Hopi katsina. And the painting of the figure is as meticulous as the knife work. Prices for Hopi katsinas can range from $100 to well into the thousands, especially for vintage ones. For the higher priced ones, this is where you need to trust your seller and your instincts. Whether you’re drawn to Hopi katsinas or Navajo dolls, whatever you choose will be a conversation starter in your home or office. If pottery is of interest, there are innumerable choices, but again, rely on the knowledge of your seller. At Tin-Nee-Ann, Christen has ‘go to’ books, including Pueblo Indian Pottery: 750 Artist Biographies, a great resource for learning more about potters and their work. And if you can make it to Indian Market, do so. Do visit during Indian Market (97th Annual, Aug. 18 – 19). Town is more crowded than usual, but the opportunity to interact with the artists is unsurpassed. Do interact with the Native American artists under the portal at the Palace of the Governors. Not only do you meet the artists, you’re buying direct. Do ask a shop or trading post to see a book or books on Native American artisans. The well-established shops usually have a small library. 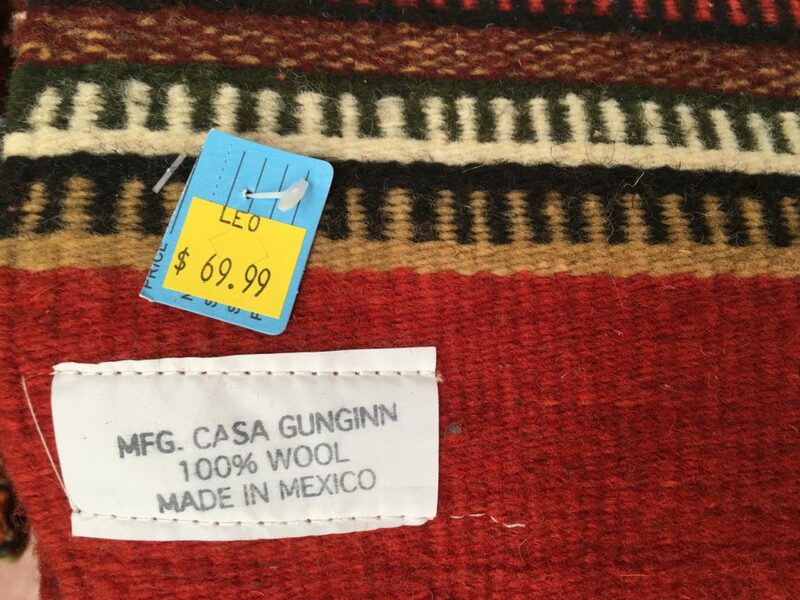 Don’t forego buying rugs made in Mexico, India and China. They’re attractive, durable and inexpensive. Just don’t be duped by sellers claiming they are genuine Navajo. Don’t shy away from buying the less expensive katsina dolls. Sure, they aren’t collector quality, but if they bring you joy, go for it! Don’t ever negotiate on price with a Native American artist. It isn’t only poor manners, it is highly insulting and disrespectful.